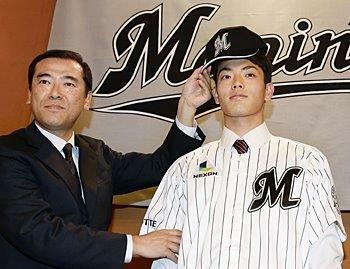 KOBE (Kyodo) -- Right-hander Eisuke Tanaka, who was drafted in the second round by the Lotte Marines, will be the first-ever Kyoto University alumnus to become a Japanese pro baseball player. The 180-centimeter, 75-kiolgram Tanaka has agreed to join the Pacific League team on the base annual salary of 15 million yen, plus a signing bonus of 70 million yen. Although he is drawing the limelight as the first from the prestigious university to debut in pro baseball, the 22-year-old said he just wants to succeed as a baseball player like anyone else. "I myself am not focused on that. I want to do my best to succeed as a baseballplayer," said Tanaka, adding that he hopes to face Nippon Ham Fighters ace Shohei Otani in a pitching duel. Nobuhira Hayashi, head of team operations, said of Tanaka, who throws a fastball which clocks 149 kilometers per hour, "We hope that he becomes an unprecedented pitcher for us." Tanaka majored in engineering after enrolling at Kyoto University but matured rapidly to demonstrate an uncanny ability for baseball before his successful draft this year. He is currently working on his graduation thesis while also attending team practices. "The shortcut to success for me is doing what I am able to one step at a time. I want to avoid becoming overly impatient," he said.